The Infiltration Tank System is the ideal way to manage stormwater run off in permeable or semi permeable soil conditions. The system is designed to capture surface water through infiltration, and then clean and filter the water before it is allowed to recharge the water table providing moisture for surrounding vegetation. The system is designed to capture surface water through infiltration, and then clean and filter the water before it is allowed to recharge the water table providing moisture for surrounding vegetation. 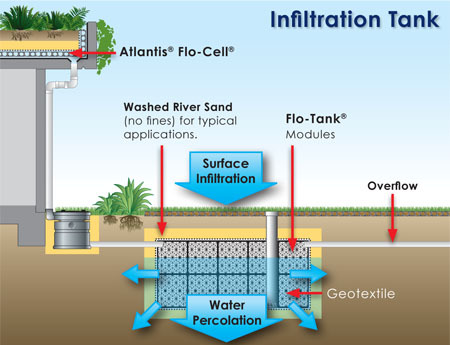 The Atlantis® Filtration Unit also captures and cleans roof water before entry into the storage area (Flo Tank Modules). New developments required to meet water sensitive urban design standards.